One ended her season on the overall podium, the other with a crash, but they both got down the gnarliest competition face in skiing. Last week, we chatted with American Jacqueline Pollard and Spaniard Aymar Navarro the day before competing on the final stop of the Freeride World Tour (FWT19): Xtreme Verbier 2019. The competition took place on the Bec des Rosses, a mountain face that strikes fear into the heart of any skier. It’s easy to just get nervous watching the best freeride competitors descend with breathtaking speed. Professional freeride skiers Pollard and Navarro were all-smiles after finishing their respective runs, so we asked them about their thoughts afterthey survived their wild descents. Pollard, happy to have gotten down. SKImag.com: What was going through your head standing at the top? Jacqueline Pollard: I was a little more nervous up there than I thought I was going to be… [There’s] drop-offs on both sides. I was definitely ready to go when it was time. Once I got on [the face] though, it’s cool. It’s definitely like, a little more playful face. It’s a lot more compact than I thought it was, and the cliffs are a little smaller, which is cool. Did you ski the line you wanted to execute? I was very close. I definitely messed up a tiny bit, but I had so much fun, it was wonderful. How does the visual inspection compare to everything else you skied this season? This year was my first year doing visual inspection. It’s definitely something you have to get used to, but I ended up kind of liking it. Getting to execute something and look at it from this different angle is definitely helpful for your freeskiing in general and improves your skiing so it’s pretty fun. Do you plan to return to the tour next year? I’ll definitely come back for another year. I love everyone here, it’s been so much fun. I’m going to go home for a little bit shred Alta, and have a little fun! Navarro, happy to be at the finish. SKImag.com: What was going through your head at the top? Aymar Navarro: I was a little bit nervous when I was in the start gate because it’s so big. From the top, you see the finish line [below], it’s super small. All the guys were pushing hard today, with super crazy lines. 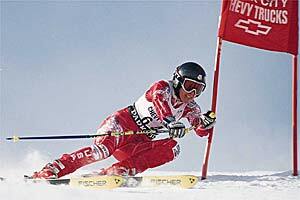 I was the last ski man, and I saw all the runs, which was more pressure. I changed the start a little bit. My first option was going to the Hollywood cliff, but a lot of people went to the same drop, and I tried to change a little bit by [going to the lookers’] left side. After that, I was going fast, that’s my style. On the last cliff, I landed in the hole of Reine Barkered... I lost control with my left ski, and I crashed. But yeah, I’m happy with the run finally. It’s so crazy competing here, the level is so high, and I’m happy to stay here. Will you compete on the tour next year? I will try. I need to decide this in the next few weeks [about] my future. But yeah…I’ll compete one more year. I like this, I like competing, I’ve competed all my life. It’s not easy to close this part of my life. But I think next season I will try going again to Verbier. Are you going to do another “South Lines” Project this summer? I hope so. Now I finish the season and I start working for that. Maybe going to South America... maybe Peru, Bolivia, I don’t know. I need to work now and yeah, I hope I’m going to South America for another South Lines project. SKI Magazine is an Official Media Partner for the Freeride World Tour. For more freeride action, catch up on the FWT19 season on SKI’s FWT Page.